A key actor in an “El Niño ready nation” is a country’s hydrological and meteorological service (NMHS). In countries affected by El Niño, the role of the NMHSs is very important as they are expected to provide a reliable and credible forecast for, and early warnings to, impacted areas when the onset of an El Nino has been confirmed. They are responsible for tracking the development of the event directly (in-situ, real-time observations of the El Nino-Southern Oscillation, ENSO); observations of regional climate patterns in a search for anomalies; preparation of the methods of communicating early warnings to at-risk regions, populations, and local to national governments, etc.). They track El Niño with observations on Earth and with satellites in space providing input data to models the NMHSs rely on to track El Niño throughout its lifecycle. In fact an “El Niño ready nation” is one that is pursuing a set of proactive actions that is really focused on a broader concept on El Niño (e.g. an El Niño Affairs rationale) which would enable the NHMS to cope with all aspects surrounding an event (diagnostics, predictions, impacts, warnings, vulnerabilities, underlying issues, etc.). There are also “latent functions” of developing the concept of El Niño ready nations as an operational goal: It is an attainable operational “way station” on the road toward the desired strategic outcome of the total modernization of NMHSs. It is a risk-free approach to modernization, which is recognized in theory at least as being more than just the transferring of new technologies. What does it take to modernize an NMHS across the hydromet suite of hazards? With respect to El Niño, to what extent are today’s NMHSs sufficiently modernized to effectively mitigate the regional consequences of an El Niño episode? 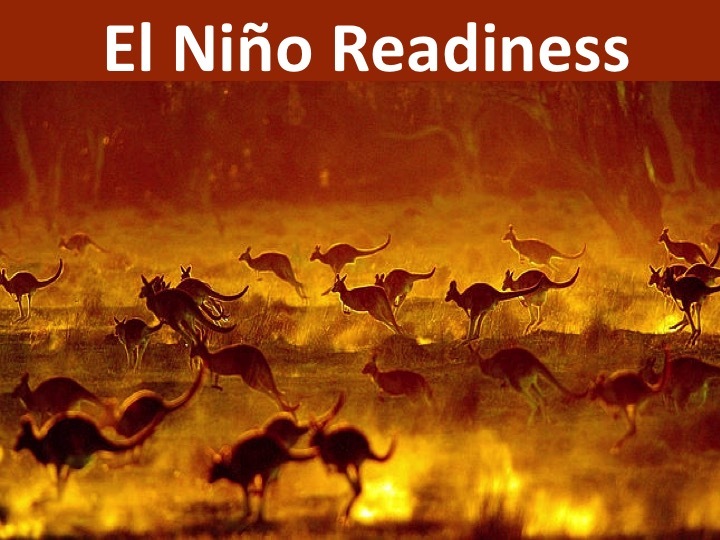 What is needed to make a country truly an El Nino ready nation? “El Niño ready nation” can be a major contributor to the modernization process. A nation with an El Niño ready NMHS will likely reach a desired level of modernization earlier and would be well on its way to becoming a weather ready nation.